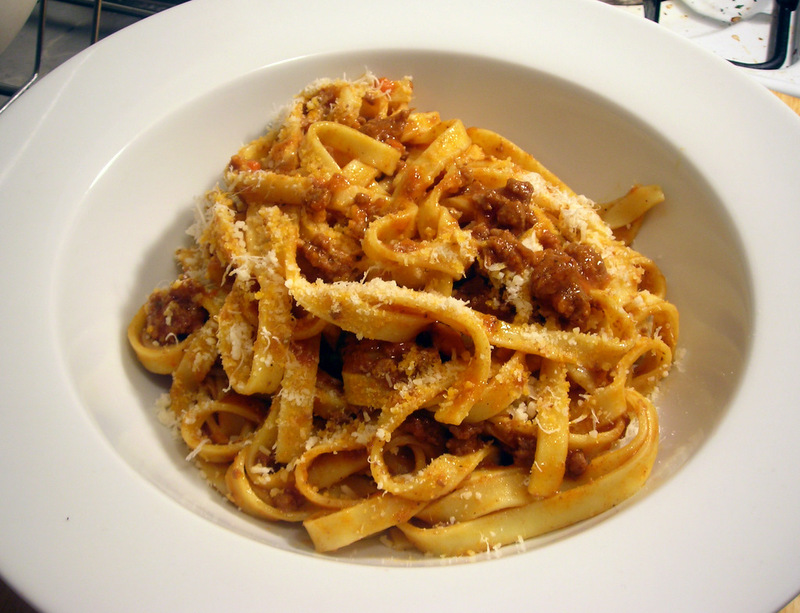 In the United States, the term “bolognese sauce” is sometimes applied towards a tomato-and-ground-beef-based sauce that bears little resemblance to the authentic version, which is complex and fragrant. A variety of meats, and sometimes cured meats, are simmered with aromatic vegetables such as celery and carrot, and a little milk and wine, to form a delicate, creamy sauce. The recipe below is adapted from Marcella Hazan‘s Essentials of Classic Italian Cooking. It’s the same recipe, more or less, except with the addition of ground pork and the substitution of fennel instead of celery. I like ground pork for its sweetness and richness, and use it often. As for the fennel, it was what I had on hand. (1) — If you choose to make this dish, I strongly suggest that you use celery instead of fennel. The fennel is listed in this post because it was what I had available in my pantry at the time. If I were to cook this dish again, celery would be my default. Put oil, 3 tablespoons butter and chopped onion in a heavy 3-½-quart pot and turn heat to medium. Cook and stir onion until it has become translucent, then add chopped fennel and carrot. Cook for about 2 minutes, stirring vegetables to coat well. Add ground beef and ground pork, a large pinch of salt and a few grindings of pepper. Crumble meat with a fork, stir well and cook until the meat has lost its raw, red color. Add milk and let simmer gently, stirring frequently, until it has bubbled away completely. Add a tiny grating, about 1/8 teaspoon, fresh nutmeg and stir. Add wine and let it simmer until it has evaporated. Add tomatoes and stir thoroughly to coat all ingredients well. When tomatoes begin to bubble, turn heat down so that sauce cooks at the laziest of simmers, with just an intermittent bubble breaking through the surface. Cook, uncovered, for 3 hours or more, stirring from time to time. While sauce is cooking, you are likely to find that it will begin to dry out and the fat will separate from the meat. To keep it from sticking, add 1/2 cup water as necessary. At the end of cooking, however, the water should be completely evaporated and the fat should separate from the sauce. Taste and correct for salt. Add remaining tablespoon butter to the hot pasta and toss with the sauce. Serve with freshly grated Parmgiano-Reggiano cheese on the side. Time: 4 hours, including prep. The sauce has a three-hour minimum cooking time; some people cook it for longer than that. This is my first entry for Presto Pasta Nights #252, a weekly foodblog event hosted by HoneyB of The Life & Loves of Grumpy’s HoneyBunch and organized by Ruth of Once Upon a Feast. 17 Feb	This entry was published on February 17, 2012 at 1:23 pm. It’s filed under cooking, food, food photography, general, Italian food, Presto Pasta Nights, recipe, winter and tagged dinner, food photography, Marcella Hazan, pasta, tagliatelle. Bookmark the permalink. Follow any comments here with the RSS feed for this post. Wow, wow. That image is super! You have a lovely space here. When you have the time, do drop by my space. I just made some lemon and cream spaghetti and would love to hear what you think. See ya! Thanks for the comment, Harry. This looks lovely! I’ve just recently started adding a teaspoon of marmite into my bolognese sauce – I don’t like it on it’s own but it’s absolutely wonderful in bolognese. I’ve heard of people using marmite, and occasionally, dried porcini (or other types of mushrooms) to contribute an “umami” type of flavor. I found the Hazan bolognese a few years ago and can make it from memory at this point. We had trouble finding tagliatelli regularly and have had success with rigatoni. If you want more Hazan, try the Amatriciana but substitute applewood smoked bacon lardons for pancetta (or see my blog here -http://mightstainyourshirt.com/2012/02/08/from-the-cookbook-1-bucatini-amatriciana-page-300/.) I look forward to further posts. Thanks for stopping by and for the comment, Ben. I have several of Marcella’s cookbooks in my library; they mostly serve as inspiration since I rarely cook directly from cookbooks. I just happened to have the ingredients for her bolognese on hand the other day, as well as fresh tagliatelle from Eataly. That being said, I’ll keep your recommendation in mind. A substitute for pancetta probably won’t happen however, as that is one ingredient you are always going to find in my pantry. It looks delicious! I have never cooked with fennel but will listen to you and go with celery instead! One of my favorite kinds of pasta dishes. Thanks so much for sharing with Presto Pasta Nights. It’s always a treat when you do. Hope you plan on joining in next week for the big birthday bash. Presto Pasta Nights is turning five!! !